Mechanical Packings – for pumps, valves and mixers available in spools or die-formed rings and sets. Pressure Seals – for valve bonnets. Hydraulic Packings – vee (Chevron) packing, lip seals, piston cups, and o-rings. Packing Accessories – lantern rings, packing pullers & cutters. Metallic Gaskets – spiral wound, soft iron, Graphonic, KammProfile, folded, double jacketed and oval boiler. Teflon, non-asbestos, Viton, neoprene, silicone, buna, EPDM, butyl, Hypalon, cloth reinforced, diaphragm, SBR-red & black, pure gum. PTFE Joint Sealant – form in-place gasket material on a spool. 3A Sanitary Hose & Fittings – for food, beverage, dairy, pharmaceutical, biotech, and cosmetics. Industrial Rubber Hose – and flexible ducting for water, air, steam, oils, acids, food tank cleaning, fire service, and bulk material handling. 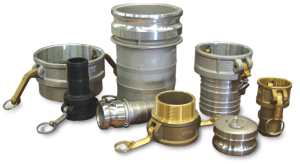 Available in custom configurations and lengths utilizing couplings, quick disconnects, cuffs, flanges, or other special ends. 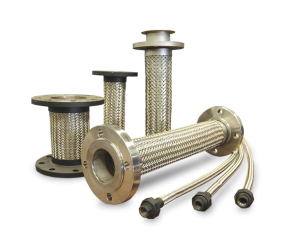 Flexible Metal Hose – custom configured hose, braid and end fittings in stainless steel, carbon steel, bronze, and more exotic alloys. Corrugated hose for fluids including cryongenic & chlorine transfer. 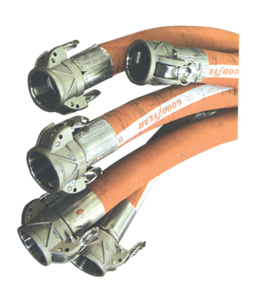 Stripwound hose for dry materials transfer. Jacketed applications, pump and seismic connectors. Fittings & Couplers – crimping, camlock/cam & groove, 3A/sanitary, tank truck, swivel & rack equipment, loading arms, bottom loaders and other. Mechanical Seals – metal bellows, split, spring loaded and cartridge designs for pumps and compressors. Replacement parts, reconditioning and rebuilding for all types and makes. Expert failure analysis. Bearing Isolators – for motors, pumps, gear boxes, fans and pillow blocks. Lip Seals – for oil and grease applications. Pipe & Fittings – process and drainage, sizes from 1/2” to 48” in PVC, CPVC, PP, PVDF, Fiberglass, HDPE, Stainless, Copper and Lined Steel. Valves – actuation, ball, butterfly, gate, diaphragm, globe, check, Labcock in PVC, CPVC, PP, PVDF and Fiberglass. Expansion Joints – rubber, metal, Teflon for piping systems. Custom made flue duct fabric expansion joints. Steam Traps – valves, condensate pumps, control valves and ancillaries for heat & process fluid control. Double Containment – PVC, CPVC, PP, PVDF, HDPE, FRP, carbon and stainless. Metering, Pumps & Instrumentation – sanitary, flow, PH, ORP, conductivity, in-line, gear, and drum. Tanks – PE, XLPE, FRP and custom. Gauges – pressure and temperature, flow indicators and thermowells. Lubricants/Adhesives – silicone sealants, biodegradable degreasers, food grade lubricants, anti-seize products and cleansers. Textiles – welding cloth, coated fabrics, tapes, tubing, sleeving for high temperature insulation. Pump Parts – shafts, sleeves, impellers, stuffing box covers, or complete rotary assemblies for popular ANSI pumps. Shims – stainless, brass, plastic, pre-cut, custom-cut or roll stock, alignment tools and equipment. Pipe Repair – water-activated, in-field pipe repair system.